Specialized has a prototype Demo 29er downhill frame in the pits at the Fort William World Cup. 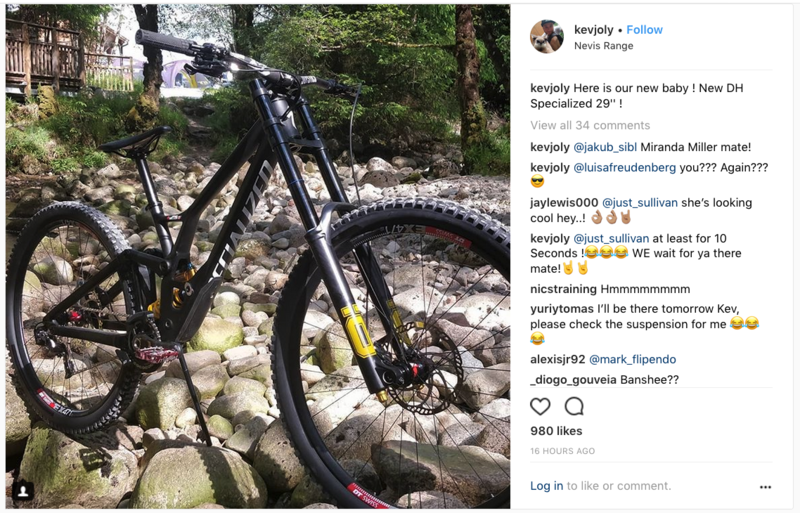 Miranda Miller will apparently be on the bike this weekend. The frame just showed up and there was not much practice time on them, so as far as we've heard (which isn't much), Finn and Loic will be on their normal 27.5 S-Works Demos. The design of this alloy prototype is a departure from the existing Demo. It features what appears to be an adjustable/eccentric bottom-bracket, and not a concentric bottom bracket as you might initially think. The bottom-bracket doesn't appear to be attached to a linkage. The bike also has an adjustable upper shock mount on the main triangle, along with some asymmetry in the chainstay area. It's possible that the upper shock mount is used to adjust the leverage curve and/or geometry. Dork out and speculate with your observations. The bike has been ready a while. The finished product was shown to some Reps. in January. looking like an interesting way to mess with the shocks leverage curve while keeping the axle path as it was. Lots of possibilities even if its kind of ugly. Fast isn't always pretty. Cannot work out the suspension motion here at all. And I know it’s not the same but it’s interesting how similar visually this is to the old demo frame set. Its the same frame design as the Canyon DH bike that Troy is on, just make the links longer and lower. The link that drives the shock is very different. I'm with you hamncheez2003. It is indeed the same layout/concept as the Canyon Sender. Very Banshee Legend-esque. I'd venture to guess most of those geo adjustments are for fine tuning the prototype. I'm assuming you won't see those on the production model. It's kinda cool how similar they look, but how different the design is. I assume the production (carbon) will be more flowy but yeah I agree...that was one clean bike. And soon you'll be able to pick it up used for way less! And a Minion DHF on that wheel he's working on. Not Butcher. Also, the butchers that are pictured are still the old design. While new design has been out for public consumption in trail models for 6 months. Very intriguing. Looks like those that like to tune and test will have even more geometry and suspension options to experiment with.